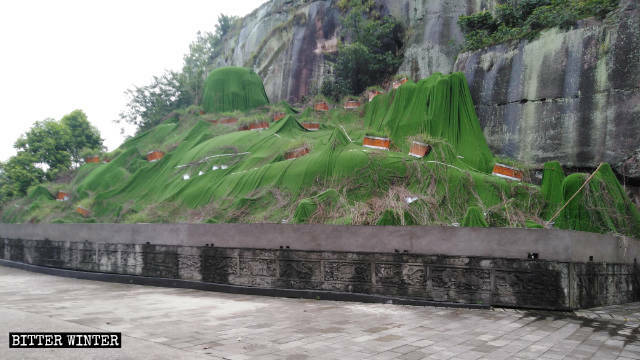 In the provinces of Sichuan and Zhejiang, authorities have demolished two large Buddhist statues under ridiculous pretenses. You have to give it to the Chinese government: Its reasons for destroying religious artifacts are quite inventive. The latest: Destroying a large Buddhist statue because it obstructed the view of pilots. The original appearance of Maitreya statue. 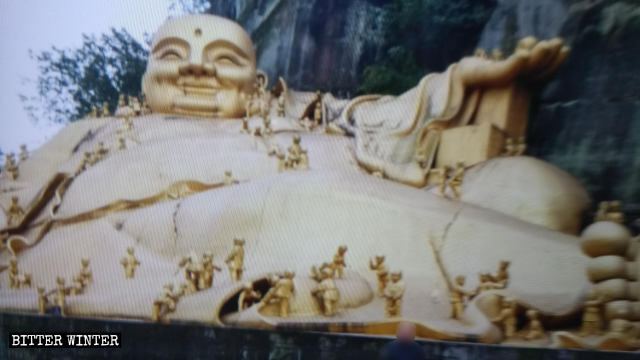 In the 4A-level Dongwo Scenic Area of the Longmatan district of Luzhou city, in China’s southwestern province of Sichuan, a large outdoor Maitreya statue, also known as “One Hundred Children Play with Maitreya,” occupied an area of over 100 square meters. (Tourist attractions are rated in China on a scale with 5A being the highest level.) The construction of the statue cost over 8,000,000 RMB (about $1,186,000), and it was beloved by tourists. Maitreya, in Buddhist tradition, is believed to be the future Buddha. 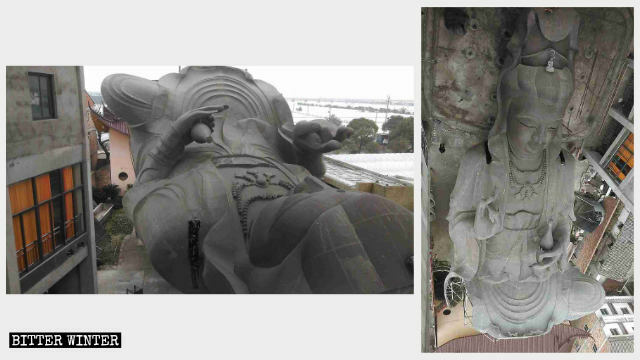 At the end of April of 2018, authorities covered the Maitreya statue because it allegedly affected “the line of sight of aircraft pilots.” It reportedly cost over 200,000 RMB (about $29,700) just to cover up the Buddhist statue. And yet, authorities destroyed the statute anyway. Before demolition, the statue was first covered up in April 2018. On October 19, the local Ethnic and Religious Affairs Bureau issued a notice saying that the statue violated a provision in article 30 of the new Regulations on Religious Affairs, stipulating that “the construction of large outdoor religious statues outside of temples and churches is prohibited,” and that it therefore must be demolished. 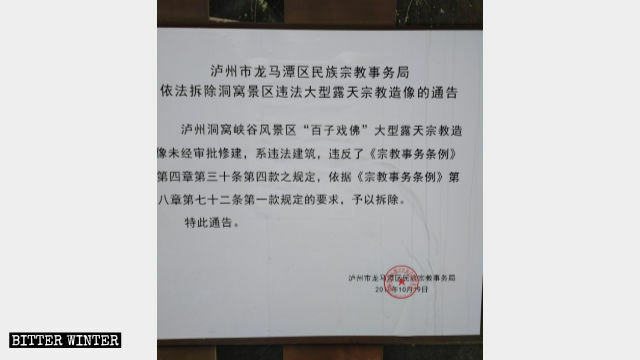 A notice issued by the local Ethnic and Religious Affairs Bureau, ordering the demolition of Maitreya statue. 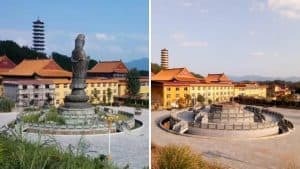 According to an inside source, at approximately 3 a.m. on October 20, Luzhou city authorities assembled over 200 individuals made up of traffic police, special police and migrant workers, as well as three excavators and other vehicles at the Dongwo Scenic Area, and initiated the demolition of the Maitreya statue. 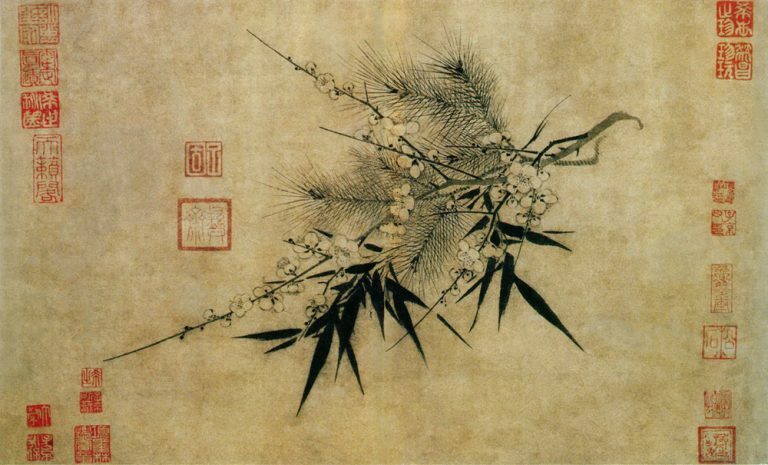 At approximately 10 a.m. on the same day, the Buddhist statue was completely destroyed. 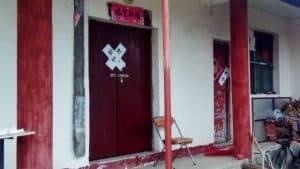 On the night of the demolition, authorities placed one of the top managers of the scenic area, along with some members of his family, under house arrest until the statue had been completely destroyed. 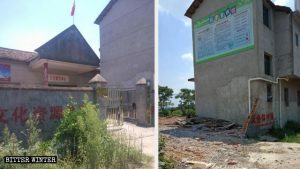 The destruction of the statue has had a significant financial toll on the owners of the 1,000-acre scenic area, which cost over 200 million RMB (about $29,652,000). The owners had taken a loan and still owe money to the bank. 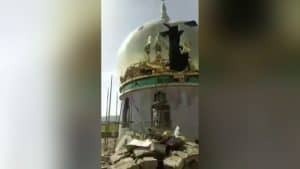 Last year, when the new Regulations on Religious Affairs came into force, authorities shut down the scenic area’s temple for not having a religious activity permit, and the head of the scenic area was ordered to sign a pledge guaranteeing he wouldn’t allow tourists to burn incense or hold any kinds of religious events. Since the Maitreya statue has been demolished, even fewer tourists go to the area, and its survival prospects are bleak. 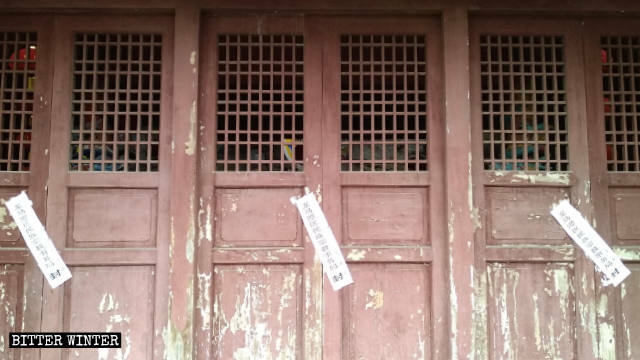 The temple in the Dongwo Scenic Area was shut down earlier in 2018. Maitreya wasn’t alone: At the beginning of January, authorities also demolished a bronze Guanyin statue inside a temple in Taizhou city, in China’s eastern coastal province of Zhejiang. The 28-meters-tall bronze Guanyin statue took over 10 years to sculpt, as well as over 10,000,000 RMB (about $1,482,600). 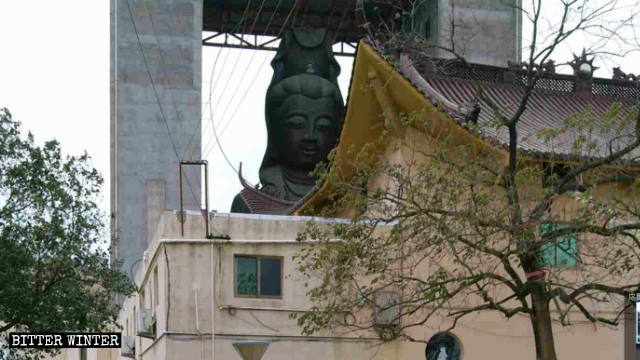 Guanyin statue inside the temple in Taizhou city before being demolished. 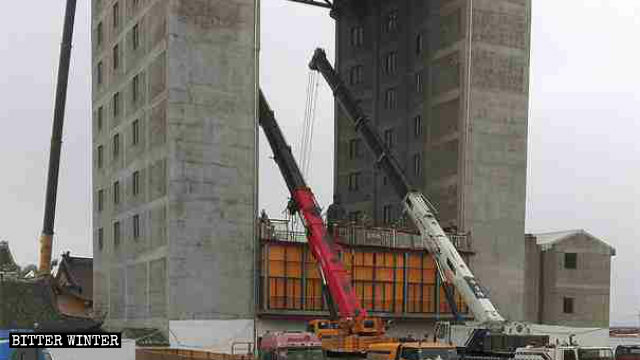 According to an inside source, at the end of October 2018, local government officials ordered the statue’s demolition on the grounds that it was too tall. If the statue hadn’t been demolished, they were going to tear down the temple with the statue in it. The demolition of the statue took over 20 days, starting on December 10, 2018, and cost over 1,000,000 RMB (about $148,260) in total. Guanyin statue is laid down flat on the ground after being completely cut open. 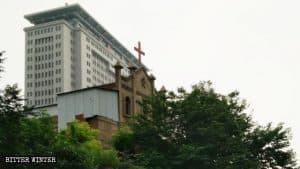 “The government’s destruction of Buddhist statues and suppression of Buddhism is just the same as their destruction of crosses and suppression of Christianity,” a local Buddhist said.